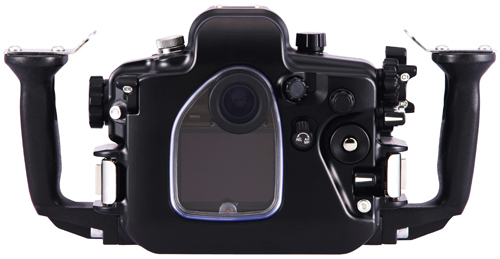 Housing for the SONY α7 ll (featuring the world's first 5-axis in-body image stabilization in a full-frame mirrorless camera) is compatible with Optical YS Converter. * Port and strobe connector (*1) sold separately. Compatible with the new Optical YS Converter/S1 (NEW) for MDX housings. Optical YS Converter converts the camera's TTL signal to a light signal. Optical YS Converters allow for TTL and manual strobe photography when using a Fiber-Optic Cable ll. * As the compatible Optical YS Converter is not a module, installation and removal must be completed by an official SEA&SEA service centre. Please contact an official SEA&SEA dealer near you. Using the VF180 (#46112) or VF45 (#46111) viewfinders increases magnification by 1.2x and provides a full field of view. The VF180 and VF45 are recommended for users dedicated to strict composition and focusing. In addition to various E-mount lenses, the camera and housing are compatible with FE series lenses for full-frame image sensor cameras via the ML-NX Conversion Ring 30 (NEW). The camera's diopter-adjustment dial can be operated from the housing. This feature is effective when two or more people (with different eyesight) use the housing. The front dial, rear dial, diopter-adjustment dial and AF/MF/AEL switch lever all have spring-loaded dampers to provide secure operation. - Equipped with two sacrificial zinc diodes to avoid electrolysis damage (one on the front case and one the rear). 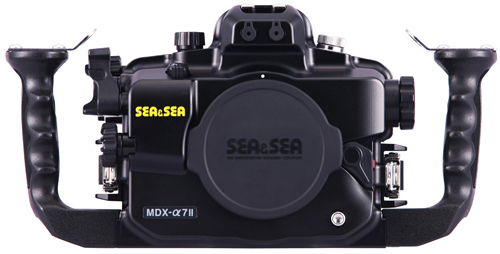 - Equipped with the Optical Viewfinder 0.5x as standard. Other optional viewfinders may be used. *1 The housing is not equipped with a strobe connector when shipped from the factory. Use Fiber-optic Cables when connecting external strobes. The Optional Sync Cord 2-pin Connector (#50122) is required if you with to use a conventional hardwired sync cable. Weight: Approx. With grips: 2,250g / 79.4oz. - Without grips: 1,860g / 65.6oz.